10 And if thou draw out thy soul to the hungry, and satisfy the afflicted soul; then shall thy light rise in obscurity, and thy darkness be as the noon day. When we are obedient; when we fast as God has said to fast; when we reach out to those in need; when we put ourselves aside and offer comfort to the broken—THEN God rewards us. 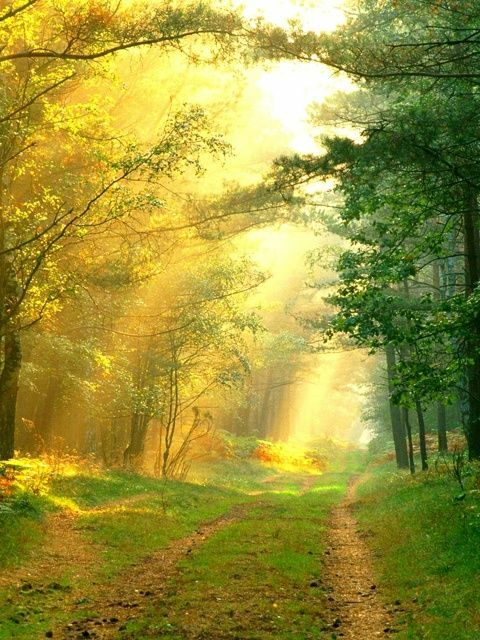 Our light will break forth like the beam of the sun on a clear morning. Health will improve. Our righteousness will be apparent. God’s glory will be our protection. We are to take away every burden from others, put down all accusing fingers, and quit all boasting. When we encourage our friends to go out to others who are needy, and minister to the afflicted person who is in want, our light will burn in the midst of calamity, trials, and adversities, like the sun at midnight. The darkness will be past. I understand that this passage is a Millennial prophecy. It is important that we keep that in mind through a great deal of Isaiah. However, I have seen these blessings on the lives of people who truly seek God, who are humble and tender toward the needs of others. There is no question about the rewards in this life of putting self aside. These verses and to the end of the chapter describe a far better way of fasting; not to bring notice to one’s own righteousness, but to make it a benefit to all those around us who could use an outstretched hand of help and hope. I saw a video the other day that made me do some self-examination. A little boy was placed at a busy post, hundreds of people walking past him. It was cold, and he had no coat. All the passersby wore warm coats, gloves, boots, hats, scarves. No one stopped to inquire why this child was alone and coatless. Finally one woman did stop, gave the boy her own coat, and when he told her he had no place to go, she got out her phone to find him some help. One person stopped. It was like a modern-day Good Samaritan story. I had to consider, would I have stopped? I don’t think I could have just walked on by without a single thought. Like the Israelites of Isaiah’s day, we like to look good. We like to have an appearance of godliness. But when it comes down to truly giving up something (fasting) that is somewhat of a sacrifice, we hesitate. We don’t want to get involved. It’s none of our business. It’s probably just a scam anyway. We are no different than those Israelites in Isaiah’s day. 10. Having a sad countenance, disfiguring the face, and making a show to be seen of men (Matt. 6:16-18). 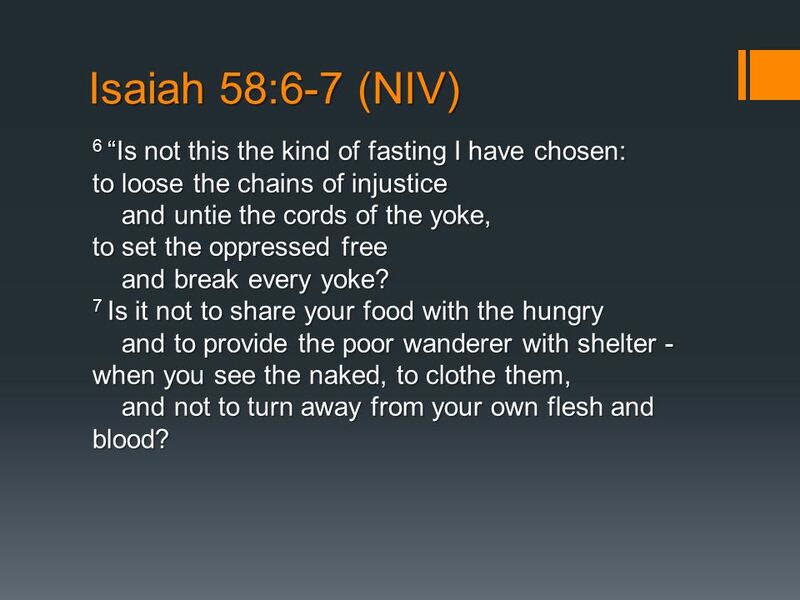 Clearly, their fasting was being done to glorify themselves, not to seek God. We ought never to make a show of how spiritual we are, for doing so proves how spiritual we are not. 2 Yet they seek Me daily, and delight to know M ways, as a nation that did righteousness, and forsook not the ordinance of their God: they ask of Me the ordinances of justice; they take delight in approaching to God. There are four commands God gives to Isaiah in this passage. He is told to cry aloud, spare not, lift up his voice like a trumpet, and show God’s people their sins. My people in this passage includes all of Israel and Judah. It is time to come to a reckoning with God. The second verse is a description of the hypocrisy of God’s people at this time. 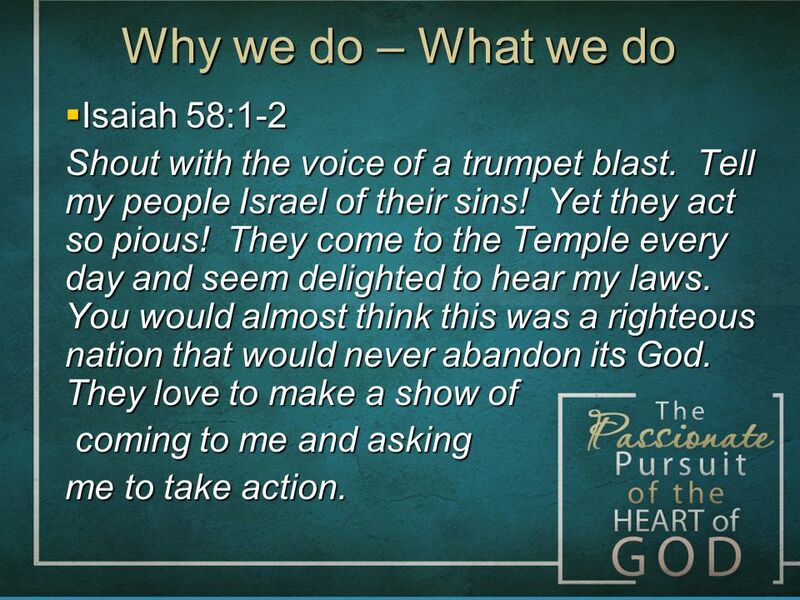 They put on a face of piety, even going to the Temple daily, showing an apparent love of hearing the Word of God. They are convincing in their outward show of piety, even making an outward show of seeking God in prayer. We are just the same. Polish ourselves up in our Sunday best for church; then when we go home we indulge in entertainments and behaviors that bring no honor to God at all. We can’t feel superior to the people of Isaiah’s day, nor of Jesus’ day. The human heart remains the same. I was at the dentist this week for a routine cleaning. I mentioned to him that my granddaughter is getting her braces off soon, and that she had the same gap between her two front teeth that I’ve always had. Never really gave it much thought before–it’s just part of me. But my dentist said, “Would you like to fix that?” Uhhhhhh, well, what would that take? And he told me that it’s not just cosmetic. My bottom front teeth are all chipped and eroded because my top front teeth meet them almost perfectly, which is really not perfect at all. Top teeth are chipped, too. I’ve had them ground off a couple of times because I looked like Snaggletooth. So he can fix my bite so my front teeth don’t chip each other, and he can close the gap. And when that’s all done, he says maybe we can repair the broken places to help stop further erosion. At my age. For goodness sake. I thought Terry would think it was just silly, but he’s actually all for it. So we’re going to do it. We’ve already taken molds of my uppers and lowers, and we’ll start the process as soon as the first set comes back. Oh, we’re doing this with Invisalign, not braces. I don’t think I’d have gone for the braces. I don’t know. Maybe. Anyway. There’s nothing deeply spiritual about my post this morning. Teeth are teeth, and compared to some of the pictures I saw while I was looking for one to post, I’m really quite fortunate. And that makes me consider. Adam and Eve had perfect teeth, no overbite or underbite or any other problem. Pearly whites, even, perfect. Did you ever wonder when those beautiful, attractive teeth started to fall apart? No dentists, orthodontia, novocaine, or false teeth. But I assure you, those teeth did eventually decay. After all, they lived a few hundred years! Tooth decay is another manifestation of this fallen world we live in. As are crooked teeth, misaligned teeth, teeth too widely spaced. Time was, the local barber would agree to pull out a rotten or broken tooth. That’s why they have those swirly red and white posts at barber shops. Do they still do that? I think I’m coming to a point here. Maybe not. Maybe I’ve already made my point. Decay and death are a result of the sin nature passed down to us from that perfect first couple. The whole world was changed by sin. 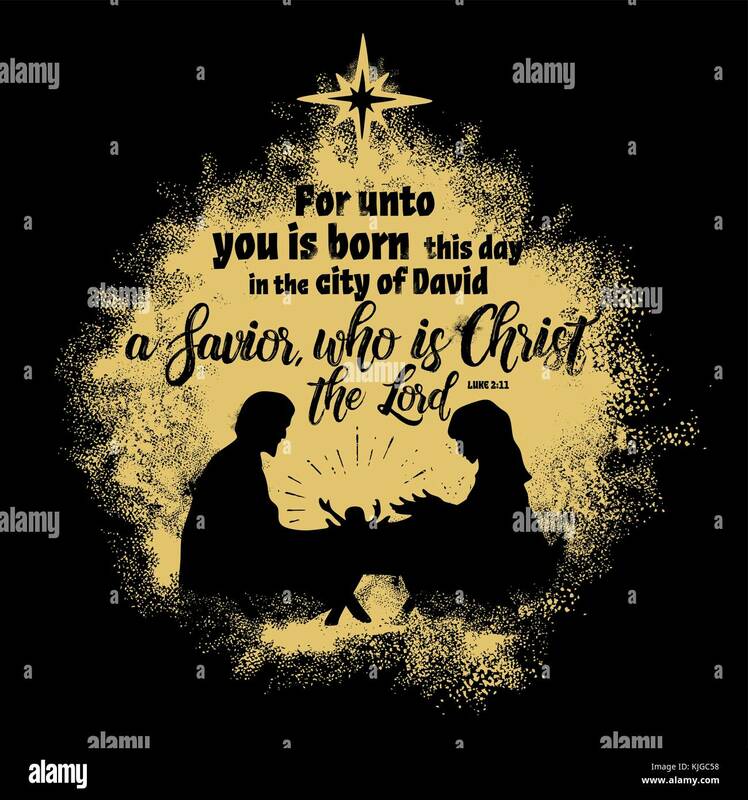 The good news, of course, is that God provided a way of salvation through His Son, Jesus Christ, Whose birth we celebrate this month. See, it always comes back to sin, salvation, God’s plan, and His Son. Words of praise to Jehovah are the fruit of the lips (Heb. 13:15). Here, God proclaimed peace to the Gentiles who were far off, and to the Jews, that were near (Acts 2:39; Eph. 2:17). For the second time, He promised to heal the righteous of both Jews (those near) and Gentiles (those afar off), but not the wicked who are without any basis of peace and healing( vv. 20-21). In this passage, the healing referred to is physical, not spiritual; if it were spiritual, the wicked only could be thus healed. As far as I could discover, the word heal used in this passage is used only one time to speak of soul healing (Ps. 41:4); but many times it is used of physical healing. 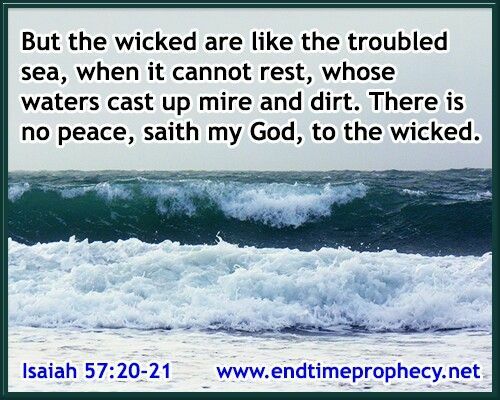 All classes of the wicked are like the troubled sea that cannot be still and constantly stirs up the mire and dirt of sin and corruption. They have no peace, no calmness of soul or spirit; their passions and appetites keep them in continual turmoil seeking something satisfying; the wealth, business, pleasure, pride, pomp, flattery and unrest of the world only keep them dissatisfied; and strong undercurrents of malice, jealousy, lust, revenge, strife, and ambitions to outdo others keep them at war with God and fellowmen. The guilt of a past life, and the burning memories of wrong-doing agitate the sinner day and night to cover up his evil, but he cannot escape the fear of hell and future reaping.